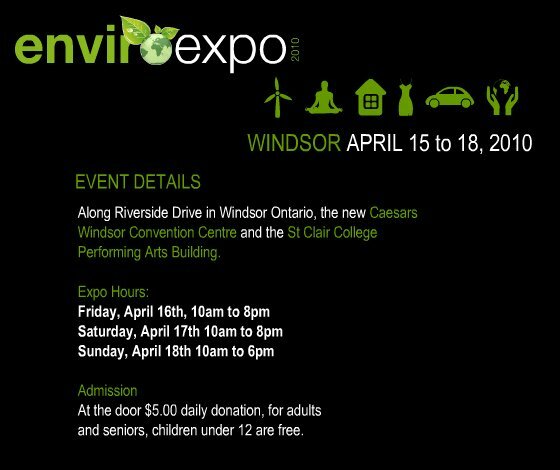 The 2010 Windsor Enviro Expo begins tonight at Caesars Windsor. Former President of the United States, Bill Clinton, will take the stage at 7:30pm, and windsoriteDOTca will be there covering the event. Then, the Expo itself starts Friday morning at 10am in two locations: the Caesars Convention Centre and the St. Clair College Downtown Campus. The Expo will feature detailed educational exhibits about environmentally friendly power sources, trends in eco-fashions, the latest in green transportation and more. Hundreds of Windsor businesses are expected to participate. Entry is only a five dollar donation to the Essex Region Conservation Foundation.